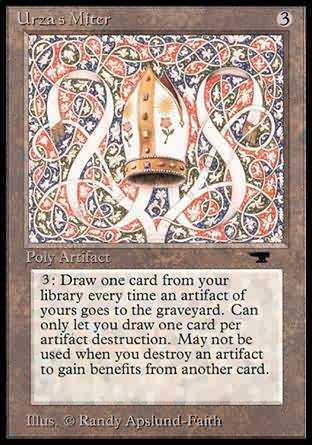 3: Draw one card from your library every time an artifact of yours goes to the graveyard. Can only let you draw one card per artifact destruction. May not be used when you destroy an artifact to gain benefits from another card. Whenever an artifact you control is put into a graveyard from play, if it wasn't sacrificed, you may pay 3. If you do, draw a card.